Very cool. Whats happening next, after the cradle and all associated work is complete? Thanks Charlie and BlackEmrald! After the cradle and rear suspension work is done, I've got to do some frame cleaning before I install the front and rear suspensions. There's some corrosion I need to address, plus the frame needs to be repainted. Once both suspensions are installed, then I can start the body work reshaping the fenders to suit the tires and straightening out the other body lines etc. I made some progress fabricating the upper half of the aft engine and transmission mounts this week. With the cradle structure complete, I used a self leveling two axis laser level to set the engine square and level to the cradle, and to project the centerline of the crank and the axles onto the cradle for future reference. I got the laser level for Christmas in anticipation of doing just this sort of thing. For some reason the beams look to be a 1/4" wide in the photo... in reality they're 1/8" wide. I honed my metal bending skills on the easier transmission mount in preparation for the more complicated aft engine mount. From the drawing on page 17, you'll see I wanted to make a tubular brace running between the top of the rubber mount, up to the corner of the aft cylinder head. That was the only place where there were bosses on the engine that could serve to mount the engine, without getting in the way of the jack shaft. The challenge was creating a bracket that would pick up the four bosses that lay in three different planes. I played around with cardboard templates for several days before I finally settled on a design I liked and transferred it to some more 3/16" plate. man, I wish I had your shop... lol! mounts look great! If I don't got the custom cradle route, I'm going to pick up a 88 cradle and make all new mounts for my 3500 F23, you pictures have given me a couple of ideas! thanks! I need to get me some of these press dies. I was just thinking the same thing! I know it will work since I have the same press lol! Everything looks great Blooz. First rate fabrication techniques as always. Starting the body work soon? Holy smokes, I need to get my chassis mods finished to catch up. Been busy designing the new ferry in 3D for production developement. Its funny.... a 400 passenger ferry is 1000 times easier to model than a 2 passenger car. When you get a chance, could you send me your final measurements for front and rear track width. Woowhoo! I'm visitor number 75,000 to my thread. Cool! Mounts look awesome! Guess that makes me 75,001! For the front mount (not shown), I also needed to drill access holes in the bottom of the front crossmember so that I could slip a socket wrench up inside to reach the nuts that hold the bottom half of the rubber mount to it. No biggie, just thought I'd mention it. Next up is to bolt all the mounts and brackets to the engine and lower it back onto the cradle, then, hope that all my laser levelling and squaring up will pay off. One thing I noticed on your welds is that you stop on the corners. I know its too late now, but you should really try to weld around the corners. It will make it much much stronger. When I weld a long bead I usually stop every inch and a half or so anyway, so welding around the corners is even more critical for me. Also, what kind of corrosion protection are you planning on all the fabricated parts? You should be thinking about internal and external protection. They may great stuff for the collision repair industry that is designed to replace the factory no-co, which is top notch. I'm not sure on brands, but I think 3M is one. Both good points made above^. That's one of the things that's great about this forum...through input from many sources (mind-pooling ) a project that was ok, can be made good, one that is good can be made great and one that was great to start with (like this one) can be made absolutly, mind blowing, jaw droping fantastic! Mounts look good to me but both suggestions above would make them even better IMHO. Thanks for your interest Bubbajoe... to be honest, I haven't quite decided which way I'm going to go with refinishing the mounts and the cradle. Yarmouth Fiero suggested I get them galvanized, but I don't think it's really necessary for what's going to be a fair weather car. Powder coating seems like a better alternative, but then I live in the country and the nearest powder coater is about 1.5 hours away in Halifax... that'd be 3 hours return to drop it off and another 3 hours return trip once done. More likely, I'll talk to my local automotive "paint-shop-extraordinaire" and see what choices are available a little closer to home. As for the welding BlackEmrald, I appreciate the tip. It's something that anyone who knows how to weld, knows to do, but in the heat of the moment (pun intended) sometimes overlooks. For Sage, I couldn't agree more... I would not have ever dreamt about installing a Northstar in a Fiero if it weren't for those who did it before me on this forum. I gathered many ideas from reading other member's build threads, taking all the best from them and adding my own mix to what I believe is a continuing improvement of the Fiero's potential. It'll be exciting to see how future build threads will make this one seem prehistoric! Thorough answer as always Blooz. Hi, would you mind if I used your hard work on the suspension setup on my build. I think it could work quite well with the extra space I have here is a photo of where I am at the moment. I remember reading your thread a while back, though I must admit I haven't visited it lately. It looks like a great, unique, build. If you can make use of my design in your chassis, feel free. For it to work properly, you'll have to try to match the locations of the various suspension pivot points, relative to each other, as closely as you can to my drawings. If you need some more details, just PM me. ...and I thought the torque strut mount was tough. Holy cow... anyone that tells you removing the old hinge boxes is easy, is either being sarcastic or doesn't know what the hell they're talking about. I can't believe how long I struggled to get those damned things off. Whoever designed the program that spot welded them in clearly wasn't thinking down the road about us tinkerers, because the welds holding them to the bottom of the rear window sill aren't accessible with a drill, grinder, cut-off wheel, or any other tool known to man. I finally got them off but it's a good thing I don't have a swear-jar in the shop. It's also a good thing that I'm replacing the lower half of the rear window sill with some rectangular steel tubing like Yarmouth Fiero did in his build thread. Mine now looks more like a piece of Swiss cheese that someone took a chainsaw to! It seems nothing was going to come easy today because after that struggle, I attempted to remove the fuel filler tube. Anyone trying this in the future should be warned ahead of time to make sure both rubber lines are taken off of the bottom end otherwise the tube simply won't pass through the hole in the lower firewall. And taking off the rubber tubes... that should take, what? Two or three minutes? Multiply that by 20. Those rubber hoses are so well attached to the metal tubes that I'm convinced the glue that holds the heat shields on the Space Shuttle couldn't do a better job. Anyways, after way more time than I want to admit, the engine bay was finally cleared of anything that might potentially get in the way of my first engine test fit. Obviously the sheet metal still needs to be plugged and sanded and painted, but that's for another day. I got busy raising the rear end using the approach that's worked for me time and again: two floor jacks and a 6" X 6". I'm always careful to raise both sides evenly and have back up jack stands under the 6 X 6 just in case one of the jacks fails. Lots of people roll the cradle under the car from behind, but I've found that rolling it in through a wheel well means you don't have to raise the car quite as high in the air. I measured the highest point on the engine at 31.5" while the cradle was resting on some wheel skates. That meant I only needed to raise the car high enough such that the lower frame rail was about 32" above the ground, in line with where the axle normally passes. Great job stripping the firewall of excess metal parts. Yours looks alot better than mine at this point. I'm embarrassed as to how mine ended up and whenever I take pics now of the car, I try to avoid any clear shots of the firewall. Thank god its going to get covered up with insulation and cladding. If anyone ever wonders how these chassis stay together with a few random spot welds of the sheet metal, try taking one apart. Blooze, I think your meticulous nature, which is a great attribute about 99% of the time, was holding you back on this "demo" portion of the build. My opinion is it is OK to destroy the part you are removing with no intentions of putting it back on, to speed up the removal process. I have removed 3 sets of the decklid hinge boxes and probably 9-10 dogbone brackets and they come out much, much quicker if you cut them into smaller individual pieces during the removal process. This allows you to have better access to the spot welds and can bend/twist the small sections to fatigue the remaining portion of the spot weld. For all the metal tabs on the firewall, use tin snips to cut the bracket in half right in the center, then grab it with some pliers and rotate/spin the bracket around the spot weld, the bracket will fold up on itself and will pull itself free of the spot weld and "usually" leaves the weld on the firewall. Then the remnants of the weld just need to be ground down. The fuel filler tube can be removed/installed with the hoses still on the end, but you need to rotate the bends to a specific position so they will slide in and out. The downside is the hoses are either glued together or 30+ years of close contact/vibration have attached them so that when you separate the hoses (so they can be rotated) you will expose fibers on the hoses. With the filler tube out, it is much easier to just cut off the old hoses and replace with new once the filler tune is back in the car. Great job as always, but I had to give you a little grief for being too tidy with your demo process! LOL. Hit the nail on the head with that one Paul. Dohhhh! Now where were you when I could have actually used this advice? Now rather than simply grinding off excess metal, I've got to fill the holes with the welder and then grind them! You see... that's why you're actually driving your car and I'm still putzing around. ...the hoses are either glued together or 30+ years of close contact/vibration have attached them so that when you separate the hoses (so they can be rotated) you will expose fibers on the hoses. You have no idea how long I tugged, twisted, and yanked on that big fuel hose before realizing it was fused to the smaller one. They were like conjoined twins sharing some vital organ. I tried to save both but killed them in the process. Notice there are no neat tidy pictures of the fuel hoses. Charlie! Don't say things like that! Geesh... are you trying to jinx me? In this picture, to line up the front of the cradle so it can be shoved into the extensions, the car would have to come down another 5-6 inches, however I only have about one inch left before the trunk wall contacts the valve cover at the rear. I think I'll try cutting part of the the floor out of the extensions to make them more like the OEM ears. That should allow me to shove the cradle forward and have the cradle rise up through the bottom of the tubes rather than having to be inserted from the ends. Hopefully that'll give me the additional clearance in the back. Just finished reading through this thing... dayum. Thanks Carbon... although you don't need to win the lottery if you spread the payments over many, many years like this project! After looking at my setup for an hour or so and seeing several other clearance problems in the engine bay, I decided to figure out why my bay seems to need more mods than others who've done Northstar swaps before me. Then it dawned on me that I've shoved my engine over to the passenger side more than most to get the clearance between the F40 transmission and the lower frame rail. (I believe most Northstar swappers have used Getrags which are probably less long than the F40.) By doing so, my already-larger-than-stock aft valve cover interferes more with the passenger side strut tower. Then to worsen the interference with the tower, I've lowered the entire chassis onto the cradle by 1" more than stock meaning that the top of the engine must squeeze into an even tighter space between the towers since they angle inwards. Luckily that's all fine because I don't need the strut towers with my new suspension design. I can keep the F40 where it's at and not have to notch the lower frame rail, and gain the necessary clearance on the passenger side by removing or cutting back the towers. Nevertheless, I became curious why I hadn't noticed the interference on my drawings but quickly realized I only drew the driver's side of the chassis in most of my drawings, assuming the clearance issues would be similar on the passenger side. Dohh! The only other clearance issue I can foresee is between the aft valve cover and the forward wall of the trunk in one small area. I don't think other Northstar swappers have had interference with the trunk wall, though I'm not sure how many have the wider CHRFA valve covers. Regardless, it should be an easy fix with a clearance bubble in the sheet metal. 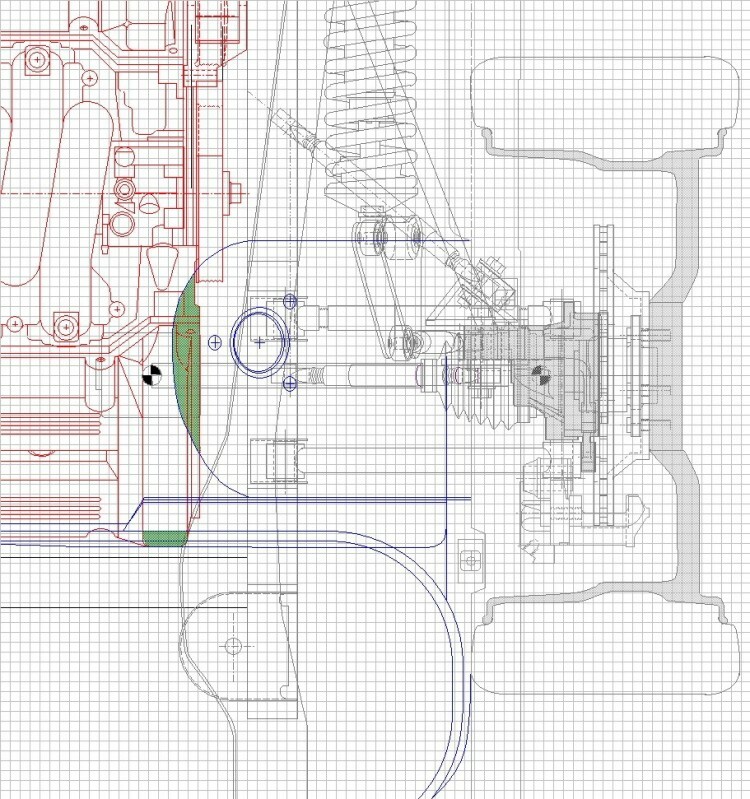 I've redrawn the top view of the engine bay (this time including the passenger side) and shown in green where the two interference areas are. Blooze are you using SolidWorks? How do you measure out all of the complex shapes and curves accurately? I would love to have my car in CAD to play with geometries and fitments but I cannot for the life of me figure out how you are getting such precise measurements. Your build is also very awesome! madcurl had the same interferance issue and had that corner modified to fit (his might have been less with the engine further to the DS). He has stated numerous times that he just uses, get this, Excel with the grid lines set to a set dimension. I don't know how he does it... it's like getting Photoshop results with MS Paint. How do you measure out all of the complex shapes and curves accurately? Painstakingly... with a laser level, bubble level, several long straight-edge rulers, calipers, a bezillion measurements triangulating everything, and lots of patience. If you looked up close, you'd see hundreds of little pencil marks used as reference and index points all over my frame in addition to the ones laid out in the FSM. It's old school, I know, but it works and it's inexpensive when time is on your side. m****** had the same interference issue and had that corner modified to fit (his might have been less with the engine further to the DS). Thanks Paul... CHRFAB offers two styles of valve covers and the one you posted is different from mine, though perhaps only in the area where the spark plug holes are. Mine have a double-bubble look with a trough running the length of the cover down the middle. Modifying the valve cover is the way to go for those that need to keep the strut towers intact. The next areas were the strut towers. My last post showed how much the passenger side tower interferes with the aft valve cover, so I wanted to remove a portion of both towers at this stage to be able to carry on with the cradle test-fit. Even though I'll probably remove a greater portion of the towers later, I wanted to make nice clean straight, level cuts just in case I changed my mind. There's virtually no way to get a straight line on the compound curves of the tower without a laser level so I first double-checked the level of the car, then set up the laser to give me a line I could trace on the tower. This photo is rather fuzzy because of the low level ambient lighting needed for the camera to capture the laser lines. I only used the vertical line to mark the tower. I went to make the cuts when my angle grinder decided to pack it in... time for a new one! Wow that does sound painstaking. What do you use for references? Are there parts of the car you consider (for example) along the car's central axis you take measurements in reference to? Then you import a text doc into CAD with the xyz points? And bubble levels geez I would go crazy haha. What do you use for references? Are there parts of the car you consider (for example) along the car's central axis you take measurements in reference to? I start by mapping the locations and measurements from pages 3J-5 to 3J-8 in the 1988 Body Service manual and use them as a basis for any other measurements and references that I set up on the main frame, and page 2A-3 in the 1988 Service Manual for the cradle. Then you import a text doc into CAD with the xyz points? No... then I sit in front of my computer using it like a high tech Etch-a-sketch and draw out the pieces one by one in three different views. The result is a vector based drawing (not simply a bitmap) which is scalable and easily modified, though has no 3D rendering capability. I would have taken an alternate route had I known I would get into a complete redesign. After marking the cut-line on the strut towers with some masking tape, I got busy with my new 5" grinder and a cut-off wheel... no turning back now! There was a lot of old undercoating and tar splashed up inside the towers and I almost wasted a couple productive hours trying to clean them about a year ago... good thing I waited because now they're headed for the junk pile. I was careful to leave the rear tower arches which are structural members joining the upper and lower frame rails, and also interconnect the integral strut tower brace that runs along the trunk wall. Swiss cheese anyone? 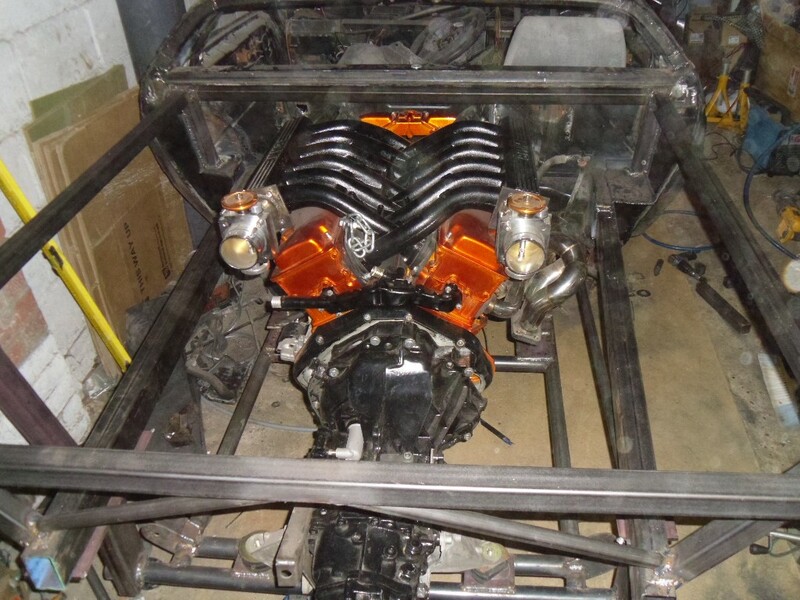 Finally, an overhead shot showing that it's looking less and less like a Fiero engine bay. Now I can try fitting the engine/cradle assembly back in to see how much of a headache the trunk wall is going to be. The gaping holes where the towers used to be should help me see where other problem areas are lurking too. Since you took the strut towers out, are you doing a double wishbone rear suspension now? If you look back to page 14, I started working on the double wishbone rear around August 2012. I went through several iterations before finalizing the design shown on page 16, along with graphs showing the kinematics... so yes... I am planning a double wishbone configuration. Bubbajoe... did you forget something in your last post? All I see is my second to last post quoted back without any other comments... strange.